We’re currently on the search for 2018’s Acoustic Guitarist of the Year, in association with Takamine Guitars. Finalists will be selected by our panel of star judges before duking it out live on stage at the UK Guitar Show this September. If you’re yet to enter, you still have time. Simply shoot a video of your playing, upload it to YouTube and send us the link using the form below. 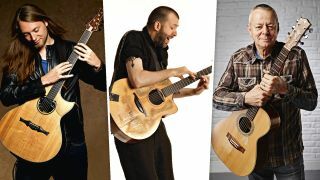 To help you fine-tune your performance, we gathered Jon Gomm and Mike Dawes - two thirds of our star judging panel, which also includes Tommy Emmanuel - to discuss their own experiences of guitar competitions and to offer their own advice on what to consider when crafting your entry. Enter the Young Guitarist of the Year competition! Did you ever enter any guitar competitions or battle of the bands when you were younger, and if so, how did you do? What qualities are you looking for from Acoustic Guitarist of the Year entries? I would routinely get beaten by a tap dancing banjo player with a dancing dog. What tips would you offer players looking to enter? What does playing guitar mean to you? 1. We need to see you play! No promo-style band videos please. 2. Keep it tight. Get to the point fast. Our experts are begging to be impressed so 15 minutes of noodling won’t make the grade. 3. Keep it musical. We’re all for fretboard madness and next-level sonics but not at the price of trusty musicality and genuine mastery of multiple techniques. 4. Make it impressive. Go for it. We want to see the full breadth of your skills in as tight a playing package as possible. 5. Just your best video please! Our experts are busy. Don’t make us wade through multiple entries where one would do. 6. Want to enter all three categories? ‘Guitarist’, ‘Young Guitarist’ and ‘Acoustic’ Guitarist of the Year? Yeah! Go for it. 1. All entries must be via videos uploaded to YouTube and submitted through the entry form above. 2. Young Guitarist of the Year entrants must be 16 or under on 29 September 2018. 3. Entries must be received by 23.59 (BST) on 2 July 2018. 4. Don’t call us - we’ll call you if we like what you’re doing. 5. You need to be okay with us sharing your video to our wider online audience, appearing in the magazine and playing live on stage at the UK Guitar Show in London on 29 September. 6. As ever, the judge’s decision – picking our finalists and our eventual winner – is final.